“27: The Most Perfect Album” Listening Party! Don’t miss this very special listening party dedicated to the release of More Perfect’s first record, 27: The Most Perfect Album, hosted by Radiolab’s Jad Abumrad and featuring music by a highly acclaimed group of artists, including Dolly Parton, Kevin Morby, Devendra Banhart, They Might Be Giants and Kash Doll. There’ll be music, booze, and a good amount of wiggles as we explore More Perfect’s musical blend of political analysis and educational activism, live with the folks who made it. Alongside the album, they’ll be launching SEASON THREE of the More Perfect podcast, deep-diving into the history and resonance of the constitutional amendments with off-beat stories and lush sound. Album recently featured on Billboard, MXDWN, Pitchfork, and more. 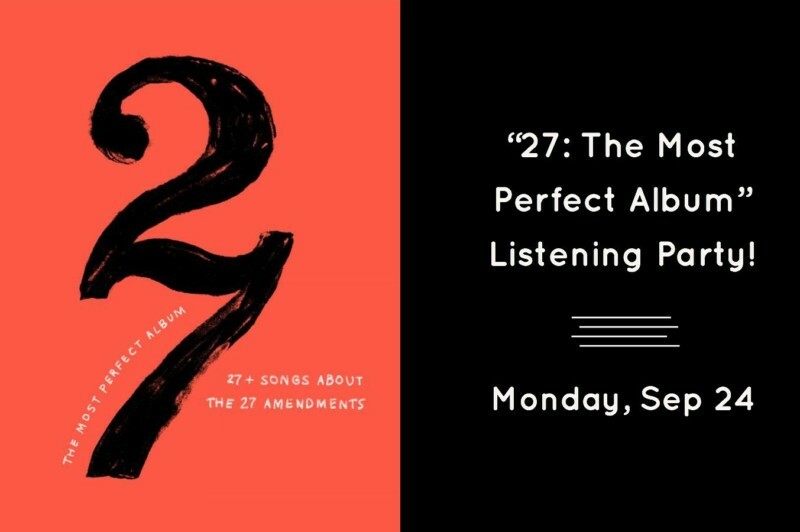 More Perfect is partnering with some of the best musicians to create an album with 27 songs about the 27 amendments to the U.S. Constitution. Each artist is taking on an amendment that they are passionate about and will interpret it in their own style. Most Americans know nothing about their Constitutional rights; this album — sort of like a modern-day “Schoolhouse Rock!” — will change that.